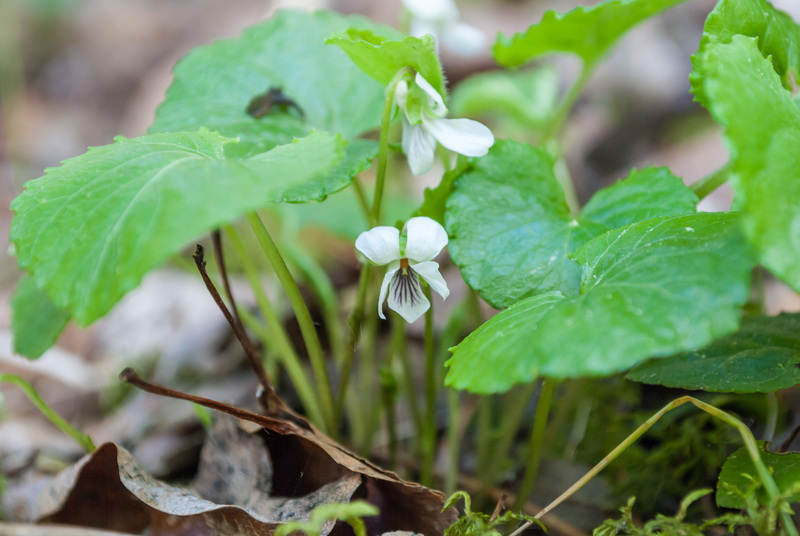 Poking through moist leaf litter or deep moss, the Kidney-Leaved Violet is one of the first signs that spring has truly come to the hills. In the four years that I have photographed this little beauty, all images were taken between the last days of May and the end of June. The species name renifolia refers to the kidney-shape of this violet’s leaves. They are further described as orbicular, or rounded-convex, and cordate, heart-shaped. (source) They are toothed and slightly hairy on the underside. One of many violets native to North America, the Kidney-leaved violet can be found across Canada and south to the northern United States. Rising above the loose cluster of leaves, its flower is classic violet distinguished by its white colour with purple striping on its lip petal and wings (side petals), although most that I have found have very sparse striping on the wings or none at all. The stripes are thought to be guides for insects, encouraging them to push into the flower’s throat for nectar. V. renifolia has no beard to comb pollen from visiting insects and a very short spur. Many violets produce a late-season flowers if the first blooms remain unfertilized. They bloom so soon after the snow has retreated from under the thick coniferous canopy that often pollinators are not yet active. These late blooms are closed and hidden and self-pollinating. Violet seeds are dispersed in small explosions and carried away by ants attracted to a special oil on their surface. I can’t imagine gathering enough to do anything with, without wiping out entire populations. I have, however garnished the odd salad with ‘johnny-jump-ups’, which volunteer en masse in my garden. Of three slightly different-looking violets that I’ve found in the local woods, the Kidney-Leaved Violet is the most abundant. It’s easily distinguished from the Early Blue Violet V. adunca by its white flowers. I’m less sure about one that might be Western Canada Violet, V. canadensis only because it has a point at the tip of it’s heart-shaped leaves. There are other features that make me less sure. A closer look next spring will hopefully tell. There is also conflict in my resources as to whether this plant has rhisomes (link) or not (link) but I’m reluctant to dig one up to find out. I’m tempted to do a little scratching next spring however because the absence of stolons is apparently one of the best ways to distinguish it from V. pallens, which is listed in Rare Vascular Plants of Alberta by Kershaw et al. I don’t think it is though, because the ones I’ve photographed have leaves that are slightly hairy on the underside.